Feeling nervous before a big presentation? Don’t worry – it’s perfectly natural to feel that way. Even those who seem to have the best, most natural public speaking skills experience nervousness before big events so have no fear, you’re not alone. You’ve probably heard the old adage that ‘practice makes perfect’ and that saying holds perfectly true when giving presentations. Preparation is one of, if not the, most important things you should do prior to giving a presentation. If you know the talk you’re giving like the back of your hand, then you’ll feel a lot more comfortable when presenting it in front of an audience. Why not rehearse in front of a few colleagues or friends? Their feedback could prove invaluable in ensuring your presentation is as good as it can be. When you give a presentation, it’s easy to make a mistake. Whether that be fumbling over words, confusing the presentation order slightly, or feeling the urge to cough, mistakes happen to everyone. It’s important that you don’t get hung up on them. Nearly all of the time, the audience won’t even realise that a mistake has been made, so don’t scrutinise your performance too harshly. Stay calm and try to forget that it even happened. Having a little trick up your sleeve can be an effective way of turning a good presentation into a great one. For example, using audience response system (ARS) technology allows you to interact with your audience, which will keep them engaged and interested in your presentation. Having the audience invested in what you are telling them will not only calm your nerves, but it will also keep your presentation fresh in their minds after you’ve finished. It may seem silly, but smiling is another effective way of making you feel more relaxed and at ease. The act of smiling releases endorphins, and reminds you that you are in a safe and positive situation. 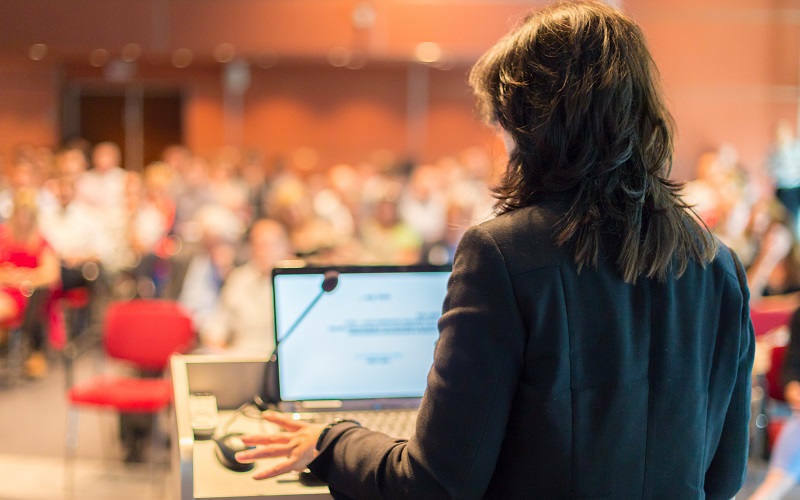 Giving a presentation is a nerve-racking experience but, using these tips and tricks, you’ll be able to manage those feelings more effectively. Remember that everybody goes through periods of feeling nervous, so just try to relax and enjoy the experience. And whatever you do, make sure you practice, practice, practice.